And so the week begins…. Most people’s week starts on Monday, but our home is odd. My hubby’s week starts Sunday night for work, and my week starts Wednesday morning for school. Since we don’t ever have a traditional week, it seems like we just hold our breath and continue our endless cycle. Somewhere in there BIL’s week starts as well. So it seems like we are in a revolving door, sometimes everyone is here, and sometimes we say hello in passing. Thank goodness Mr. Blue Eyes gets quality time with mommy and daddy, although sometimes it’s at different times. Mornings are my time generally. Mr. Blue Eyes is a morning person, and although mommy is not, mommy can put aside her grumpiness when she sees that big smile wandering toward her. Daddy on the other hand is a rock, Baby Blue can climb on him and smack his face and he’d never even know it. So mommy and baby get mornings. We watch cartoons, we cuddle, read books and sometimes we chase the puppies around while trying to feed them Honey Kix. Domino is the smartest when it comes to little people food. He knows if he’s gentle and gives a kiss or two, eventually Blue Eyes will cough up a bite of whatever he’s eating. And yes, it grosses mommy out to no end that he will share bite for bite. Afternoon is usually daddy time. Daddy functions better in the afternoon, so by the time mommy is exhausted from chasing Blue Eyes around, daddy is ready. Mommy will pop him down for a nap and when he wakes up daddy takes over. Mommy wouldn’t normally nap, but this little baby girl in her belly is making her tired. We’ve tried telling Blue Eyes that mommy has a baby in her tummy. He just laughs and shakes his head no. I don’t know if he understands or just thinks it’s funny when mommy says baby and points to her tummy. I hope he gets along with her as well as he gets along with the little girls at daycare. Some days mommy and daddy don’t get their time till weird times. Mommy has school, daddy has work, and so he chases uncle and the pups around. All in all, I know my little boy is spoiled with attention. I have about 12 more weeks of school, until my test. I’m not sure what day I will actually graduate since it goes off of time, but I’m not really in a hurry. The longer I stay in class, the fresher the information will be when I test. Also, it’s getting harder for me to move now that the baby is showing. I am definitely getting round. It takes a while to reach the floor, or move laundry over. Cleaning the bathroom today must have been a funny sight. 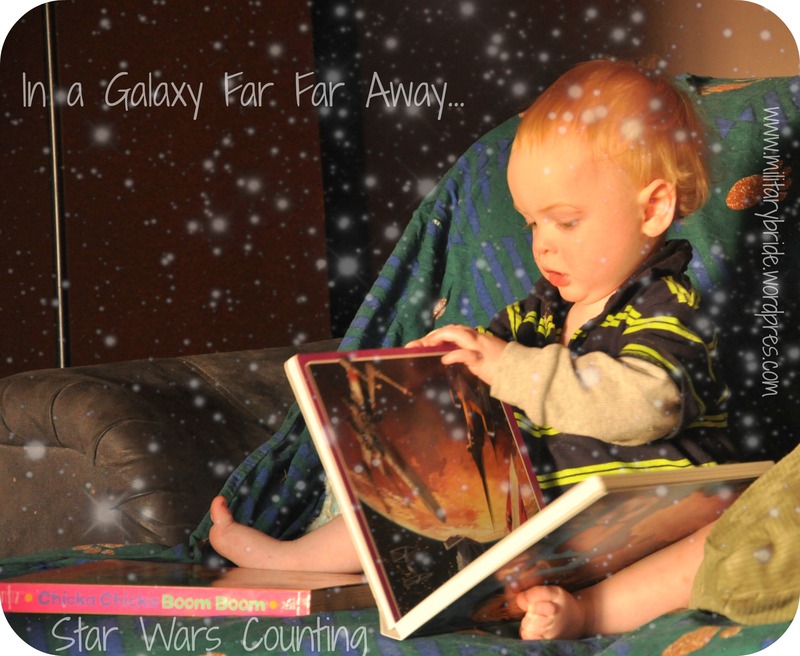 Posted in Uncategorized and tagged baby boy, blue eyes, home, little baby girl, military baby, military family, mommy and daddy, motherhood, reading, star wars. Bookmark the permalink.